The ruins of the Maya city Tikal are found in the province of Petén. 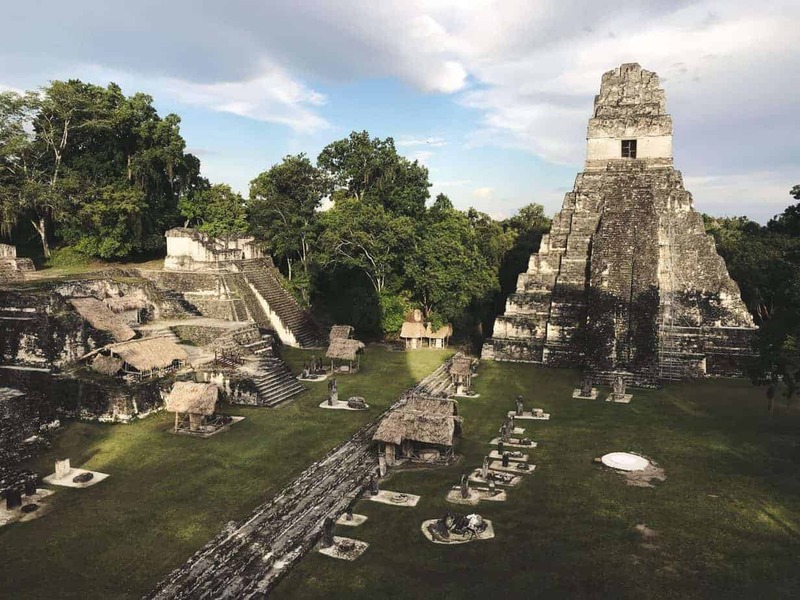 This city, of which 16 square kilometers have been excavated, forms part of National Park Tikal with an extension of 576 square kilometers, which is nestled inside the Maya Reserve Biosphere with an extension of 1.5 million hectares. The city boasts around 4,000 structures and is totally surrounded by a luxurious forest full of animals and contains Maya temples rising 70 meters, the highest discovered so far. The park was created in May 1955 and in 1979 UNESCO declared it a World Heritage Site. By the end of the XIX century Alfred Maudsley and Teobert Maler had photographed some monuments but systematic exploration did not start until 1956. The first sign of inhabitation date from the year 900 BC and believed abandoned at the end of the IX century. Tikal is considered one of the largest Maya cities of the classic period and its location, almost at the center of the Maya world, placed it in a strategic position for commerce. Archeologists think that during its apogee 10,000 people inhabited Tikal. Here as well as in the archeological site of Uaxactún are found the first indications of the Maya pre classic period, such as the stepped pyramids with covered summits of cosmic creatures. In fact, the oldest known recorded date by the Maya is found on stela 29 and reads, 292 AC. The mystery of the Maya civilization is profound. To this day no one can explain how they managed to achieve such a high degree of civilization in the jungles of Central America nor why that great civilization disappeared so rapidly, so completely and without leaving clues more than 1,000 years ago, leaving the Maya descendants as they were at the beginning of their ancestors rise to glory. In fact their descendants don’t know precisely how their ancestors called themselves. A Spanish chronicler was standing near some ruins and asked a local Native American the name of the people that had built them. The answer was “maya”…neither the chronicler spoke well the native language nor the local Spanish…the answer could have been the name of a tree, the time of day or something else. The chronicler true to his purpose wrote: “maya”. Flores is a town in Petén, Guatemala. The town proper is an island on Lago Petén Itzá, connected to land by a causeway, on the other side of which lie the twin towns Santa Elena and San Benito. Flores is served by the Santa Elena International Airport but commonly known as Mundo Maya International Airport – and is the airport that visitors use as the gateway to Tikal. Tikal was a Maya city of great power and size, the largest of Maya cities during the “Classic Era” over 1000 years ago. Many beautiful buildings have been uncovered and many more wait to be discovered. Amongst the many Maya sites in Central America, Tikal is perhaps the most breathtaking because of the scattered impressive buildings which have been restored in an area with many more ruined buildings still enveloped by the jungle. The sight of the temples poking through the canopy is quite awesome. You can climb to the top of a few of the temples and get panoramic views from above the tree tops. This is one of the available experiences when staying in one of the hotels actually at the park entrance – enter the park pre-dawn and watch the sunrise over the jungle canopy accompanied by the hoots and hollers of monkeys and jungle wildlife. If you are very lucky, you may catch a glimpse of a native Jaguar. Tikal dates back as far as 400 BC, and grew into one of the largest and most powerful of the Mayan cities during the Classic Period (AD 200-900). It often clashed with other cities in the region, and was eventually defeated by Caracol in 562 AD. King Ah Cacau returned Tikal to its former glory about a century later, and it remained somewhat prosperous until the general decline of Mayan civilization set in around AD 900. Tikal was eventually abandoned completely, consumed by the jungle, and pretty much fell off the map until proper archeological excavations started in the 1960’s. The magnificent Mayan ruins and World Heritage site of Tikal is located in the Northwest of the country, and is really only achievable as a trip by flying from GUA. There are several flights per day. The park itself opens at 6:00am, and officially closes at 6:00pm. Visitors staying overnight have a choice of a modern 5* hotel in Flores or a smaller (but safe and clean) hotel actually at the gates of the park. It should be noted that it is a several mile ride from the gates of the park to the site itself over a road with a 10km/hr speed limit that is strictly enforced – so it may take as much as 20 minutes from arriving at the park entrance to actually disembarking your transport. As a daytrip (albeit a very busy daytrip), it is possible to take an early flight (departing Guatemala City approximately 7am), retuning in the afternoon (approximately 4.30pm). We advise doing this at the end of the fishing trip, so that on return from Tikal, you can stay in the hotel (Marriott, InterContinental) in Guatemala City for departure home the next morning. Alternatively – and a little more relaxing – is to stay overnight in either Flores or close to the park itself at Tikal. This is therefore a 2 day trip with an overnight. We have a choice of hotels from 5* (in Flores) to 3* at the park itself (a little more “rustic” but forgoes the drive early in the morning. In both of the above options, we will organize on your behalf connections/transport, private tour of the park with an English speaking guide and accommodation(s) as required. Breakfast is available on arrival, and lunch is provided in the park. Lake Atitlan – is a beautiful volcanic lake surrounded by high hills and dormant volcanoes. The lake is surrounded by a series of small villages named after the saints, each having their own personality and offering opportunities to shop, browse and absorb the colourful culture. The lake is renowned as the deepest lake in Central America, and although it has yet to be fully sounded, it is known to be at least 1000 ft deep at its deepest point. The region encompasses the lake and the towns around them. 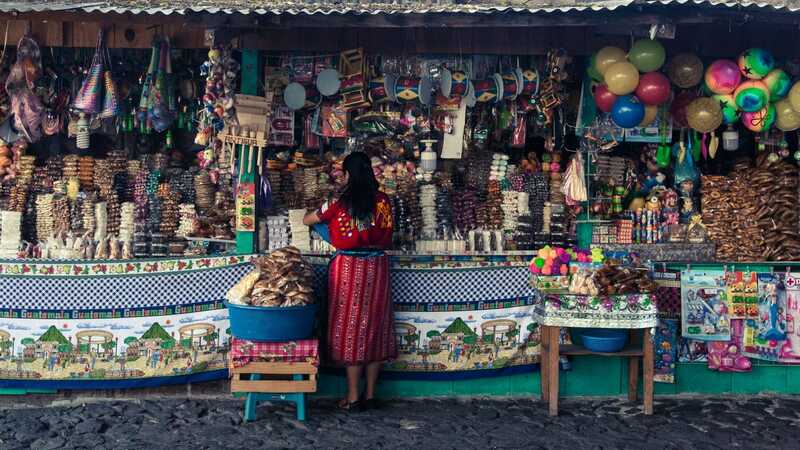 Panajachel is best known, and a good entry point, but more off the beaten track are San Pedro la Laguna or the “less party, more meditation” village of San Marcos. Due to the region’s popularity, other towns along the lake, such as Santa Cruz la Laguna and San Juan are now starting to see growing tourism. Many lanchas, or small boats, provide transport from village to village around and across the lake. Some boats are scheduled like buses; others will go as soon as they accumulate enough passengers, like share-ride taxis. There is plenty of accommodation available – although it is strongly advisable to organize it before you arrive – ranging from fairly basic posadas to very good “almost” 5 star hotels on the shores of the lake. Lake Atitlan is a trip from the coast that realistically needs at least two days. The drive itself is approximately four hours from the coast (about 2-3 from Antigua), but can take longer based on traffic and road conditions. An overnight at least is highly recommended so that you can tour some of the major towns on the shores of the lake -= and take the time to relax and enjoy a pleasant meal overlooking a remarkable view. We would be happy to organize or make recommendations for you. If you can take a little longer, and time it correctly – a good route to take is coast – Atitlan (Panajachel) – Chichi (below) – Antigua, stopping off along the route. This is fairly easy to organize as each of these legs are well established minibus routes, so timing can be flexible. comedores (small eateries).Among the items sold are textiles, particularly the women’s blouses. The manufacture of masks, used by dancers in traditional dances, such as the Dance of the Conquest, have also made this city well-known for woodcarving. The lake is 144 kilometers from Guatemala City and is without a doubt the most important natural attraction of the region. 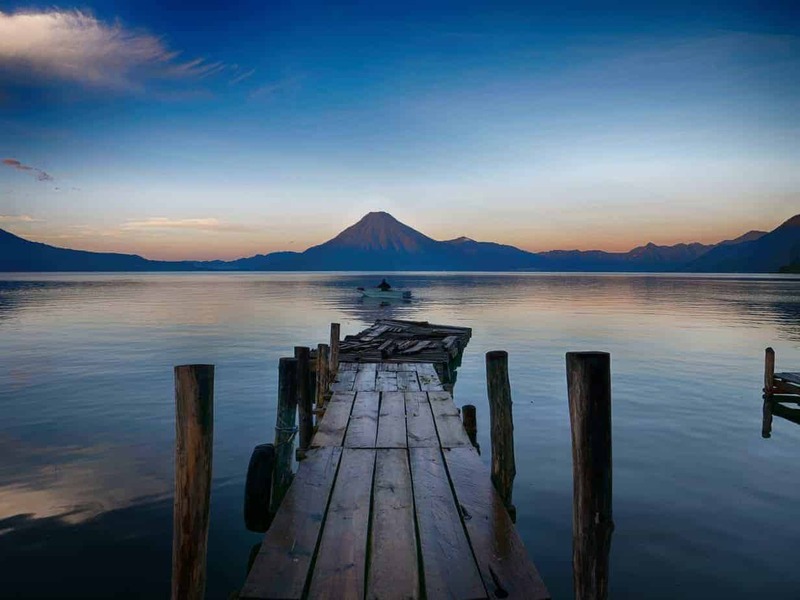 When novelist Aldoux Huxley visited Guatemala he referred to the lake as “the most beautiful in the world….too much of a good thing..”. Years before Huxleys’s visit, after a fierce battle Pedro de Alvarado (the Conqueror of Guatemala) decided to camp on its shore to rest and observe its natural beauty. Three spectacular volcanoes: Tolimán, Atitlán and San Pedro form a natural backdrop to the lake which is at 1562 meters over sea level. Its 18 kilometers long by 12 wide at is widest point with a depth of around 320 meters. For many years it was thought the lake had no bottom since a superficial drain has never been found. During the morning the waters are smooth and calm changing in color from blue, green and gray. In the afternoon blows the Xocomil (the wind that carries away sins) chopping and agitating the waters making any voyage hair-raising. The Maya believed that if the wind blew from the north it meant the lake was returning the body of someone that had drowned…after having claimed that person’s soul. Besides unsurpassable natural beauty, Lake Atitlán also offers picturesque villages. The 13 villages along its shore of predominantly of Native American inhabitants are mostly only accessible by boat. Some years ago the Native Americans began construction of a road that would connect all villages called the Royal Road but some obstacles were insurmountable and the road was never finished. If one desires, in 5 or 6 days one can walk around the shore of the lake, camping on the beach or at resting at the various villages. Since ancestral times the shores of the lake have been inhabited due to the quantity of fish in its waters and variety of animals on the slopes of the volcanoes that surround it. During Holy Week in Guatemala City can be observed majestic processions but they are not so well known as their counterparts in Antigua Guatemala. The floats penitents carry are larger and heavier than those used in Antigua Guatemala since the streets and avenues of the capital city are wider thus permitting larger turning radiuses. Located in the Panchoy Valley (big or dry lagoon in Kakchiquel) at 1530 meters over sea level, Antigua Guatemala possesses a spring climate all year long. Impressive hills and volcanoes surround the city: to the north, the Manchén and Candelaria hills. To the south rises Volcano Agua, a popular tourist destination because of the extensive, beautiful view seen from its summit. To the east the Manzanillo and La Cruz hills, La Cruz being the most popular spot to observe the city from, obtaining its name from the large cross near its top. To the west volcanoes Acatenango and Fuego, which recently erupted, and from the city, on clear nights, a lava flow can be seen moving down its side. The city of Santiago de Los Caballeros de Guatemala was founded July 25, 1524 by the Conqueror of Guatemala, Pedro de Alvarado. The Italian Antonelli made its urban design in 1543. The first printing press arrived in 1660 and today at the Museum of the Book some books dating from the XVI and IXX centuries can be found along with copies of other works printed there. In 1678 the third university to be opened in Latin America was founded: the Royal and Pontifical University of San Carlos of Borromeo. In 1729 one of the first newspapers of the Americas appears: the Guatemalan Gazette. The Central Park fountain, called the Mermaid Fountain, was built in the XVIII century. During its apogee in the XVIII century, the city had 50,000 inhabitants. The Santa Marta earthquake and political issues forced its abandonment between 1773 – 1776. 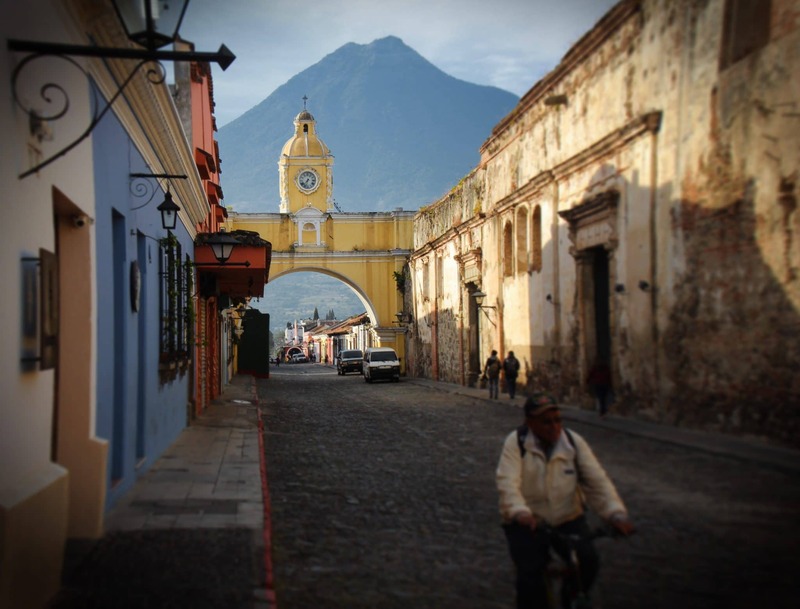 UNESCO declared Antigua Guatemala a World Heritage site in 1979. At a first glance the city of Antigua looks to have been abandoned due to the earthquake of Santa Marta that occurred July 29, 1773 and the capital transferred to the New Guatemala de la Asunción. The principal reason why the capital was transferred was political since once before an earthquake in 1717 had damaged it but this disaster, instead of causing its abandonment, generated a tremendous boom in construction without precedent. The government wished to diminish the influence the church had over it and reduce its economic power. Through the years religious orders had acquired a huge amount of property in Antigua Guatemala, which made them extremely rich and powerful since merchants, politicians, common people, etc., either had to pay rent or acquire property from them. What better way to take away wealth and power from the church than move the capital to a place where the church had no property and at the same time reduce the value of that which it possessed? At the beginning there was resistance and as an incentive and to speed up the pace, several buildings were totally or partially demolished until the inhabitants became convinced that it was in their benefit to move to the new city. Antigua has many characteristics that endear it which the visitor. The streets were covered with cobblestones, not to ruin the suspension of cars or break the heels of high heeled shoes as many residents and visitors suspect, because during colonial times cobble stoning streets was a defense mechanism….shod horses cannot run over cobblestones: when they try to run they slip and slide endangering themselves as well as their riders. On some old big entryway doors you might observe doorknockers too high to use. These doorknockers were designed to be used by horse riders and not by very tall people or placed there by recluses that did not appreciate visitors. The ornamental balconies, made out of iron or wood, are beautiful reminders of a time when gallant men visited their beloved and talked to them and gave them serenades through the bars. Antigua is a beautiful city with many places to visit and activities to do all year but for Holy Week, it dresses in its finest. Thousands of people from around the world, motivated by faith and a feeling of adventure, travel to see processions considered the most impressive and extravagant of Latin America. Devout persons labor long hours making rugs out of sawdust of different colors, flowers, pine, leaves, small ceramic pieces, etc., all along the streets where the procession will pass. The Cucuruchos (men, women and children of all ages), as the penitents that carry the floats are called due to the conical hat they wear, dress in the color of their order: purple, black, white and red. The floats are really impressive made out of fine woods, with allegorical designs that change year to year, sculptures dating from colonial times made by renowned master carvers, flowers, plants, lights, etc. Floats weight up to 3.5 tons needing 80 men to carry them. Behind the float goes the band playing sad notes that help the penitents keep rhythm followed by a large crowd of people that accompany it along its route. In front of the float walk the incense burners filling the street with smoke and fragrance giving the procession a medieval touch, especially at night. Researching your trip to Guatemala? 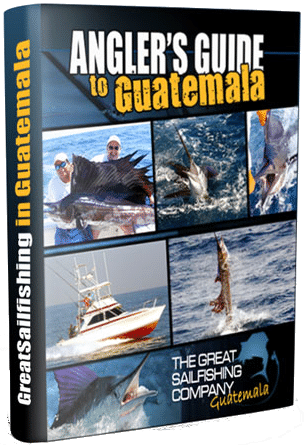 Register here to get the latest fishing reports from Guatemala and to receive special offers.